The Centurion Card from American Express currently has an Informr score of 7.9 out of 10. This score is based on our evaluation of 5 sources including reviews from users and the web's most trusted critics. 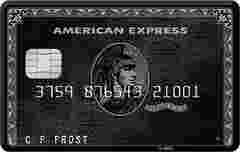 Centurion Card from American Express is typically available to those with excellent credit scores (650 or greater). The Centurion® Card from American Express — known informally as the American Express black card — is an invitation-only travel rewards card reserved solely for Amex’s biggest spenders. If you make the cut, you’ll enjoy some of the credit card world’s most-elite benefits and perks. Just a glance at the price tag screams exclusive, so the true benefits offered with the Black Card may only be known to cardholders. At any rate, this credit card serves more as a status indicator without proper knowledge of its benefits, yet this is a status that many strive for. If you have the option to get the card, it could very well be worth the large $2,500 annual fee and $7,500 initiation fee if you travel frequently and your time is highly valuable to you. The wide range of luxury benefits such as lounge access, personal airport guide, personal concierge service, and elite status could add up in value when used frequently. The Centurion® Card from American Express won’t be an option for most people. This invite-only credit card is reportedly only offered to those who charge over $250,000 to their card each year. However, it's by no means a bad card. In the hands of select individuals, the Centurion® Card from American Express can save thousands of dollars on business and first class flights. There's a long list of benefits to having the Black Card and, for frequent travelers (particularly those that stay in luxury hotels), the benefits may indeed pay for themselves. That being said, other travel credit cards offer similar benefits at a much lower cost. Ultimately, if you think you’ll make good use of the benefits (particularly the concierge service and travel perks) and the annual fee isn’t a burden, then it’s worth at least considering getting the Black Card...if you’re invited.